This section is for the articles that don’t really fit anywhere, but still have an integral part in all things Mormon. 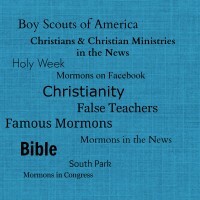 You’ll find info about the Boy Scouts, South Park, famous Mormons, odds and ends about Mormonism in the news and other ne’er-do-well false teachers that roam the earth. Thoughts on why abortion is rampant in America & yet priority was placed on saving babies during hurricane Sandy. Why is there such a disconnect in the minds of Americans? Warning for the body of Christ! In 2011 a gender neutral version of the Bible was published and why we should be aware of its dangers. Joel Olsteen, Shame on You! June 2014 – Glenn Beck’s radio rant on why ‘others’ should unite with him on social issues and his public put down of Christianity. Written by Ed Decker – His take on why Glenn Beck will cozy up w/ Christian minister David Barton to promote Barton’s new rewrite of the NASB. Written by Melissa Grimes in an answer to a Christian who e-mailed asking us to spread the word that Beck was invited by John Hagee to speak at large gospel event. Questioning Reid’s comments about the American border being secure and his life in Mormonism. The link above is for info from 2008 and 2012 on Mitt Romney’s campaigns, how the LDS Church behaved with their many ads and Christian leaders like Pat Robertson, Liberty University and the Billy Graham family who regrettably endorsed him. After fighting a nine year battle against the British Government to be exempt from paying property taxes, the Church’s appeal case was lost in the higher European Courts and ordered to pay their taxes on LDS temples in Great Britain. Founder of Ordain Women gets the boot from the Church banning her from Mormon activities for her outspoken views on women in the Church. The two articles above explore why ABC News’ report on the Mormon Church didn’t tell the whole story about Mormonism. Living through the aftermath from the fog of Mormonism. We’re wondering why Mormons believe financially impoverished people are spiritually impoverished as well. What about Jesus? Was He spiritually impoverished? Why do Mormons take pride in the similarities they have with an occult organization like the Masonic Lodge? ‘Holiness to the Lord’ is chiseled into the temples & DC monuments and is anything but holy.